Clean, quiet electric buses to begin service in downtown St. Pete early 2018. Sierra Club's Phil Compton and Craig McCorkle after board vote approving purchase of PSTA's 1st 2 electric buses. Almost two years after being introduced to the technology by Sierra Club, the board of the Pinellas Suncoast Transit Authority (PSTA) voted 9-5 Wednesday, in an historic first, to buy two all-electric buses from manufacturer BYD. PSTA will use the buses to provide a clean, quiet ride to popular waterfront shops and restaurants on St. Petersburg’s Beach Drive, the Tampa Bay region’s most beautiful and challenging urban location to park a car. Gerard and BYD's John Hatch. Clearwater City Councilman Bill Jonson, an initial skeptic, supported the transit agency’s embrace of this emerging technology. Finance Committee Chair Joe Barkley of Belleair Bluffs pointed out how zero emission electric buses’ substantially lower operating expense, both fuel and maintenance, lets the agency save taxpayers funds that can help cover the cost of the more expensive diesel fuel used by the rest of PSTA’s fleet, while at the same time eliminating noise and air pollution. As at every meeting where bus purchases have been discussed in the past two years, Sierra Club Florida Healthy Air Campaign activists spoke in favor of electric buses over diesel. Sierra Club set up the first electric bus manufacturer’s presentation for PSTA staff and board in May 2015. And as with each of the six electric bus demos at PSTA in the past two years, the media turned out to cover this exciting new way to travel the county's roads without the noise and pollution that give transit a bad name. Through a campaign of education and advocacy, Sierra Club and its many allies in the Tampa Bay Zero Emission Coalition provided PSTA with accurate, up to date information on this new clean and quiet alternative. Despite persistent opposition from a handful of board members, one of whom equated electric buses with “burning banana peels for fuel”, the agency now recognizes that its industry is moving forward to embrace this new technology that many say will completely replace diesel within the next two decades. Earth Day event in downtown St. Pete. Practically all of America’s three dozen other transit agencies now making the switch to electric buses have done so by winning a special federal grant. PSTA’s higher initial cost for electric buses was instead offset by an allocation of $589,000 from the Pinellas County Commission’s BP gulf oil disaster settlement fund. Sierra Club supported the Commission’s use of these funds to pay for an on route charging system that will provide seamless service. This will make it possible for PSTA to continue to add more electric buses, with no additional cost for charging infrastructure, creating the potential for an affordable, all-electric fleet of BYD buses to soon serve more areas of St. Petersburg and Pinellas County. for healthier air for everyone. Sierra Club Senior Organizing Representative Phil Compton said of the decision: "Downtown St. Pete's busy streets are a great place for PSTA to begin electric bus service. These buses don't have tailpipes, and today the electricity they use creates just 20% of the carbon emitted by any new diesel or natural gas bus. That percentage will steadily decline towards zero % for electric buses as we add more solar to the grid, while all other types of buses stay just as dirty as they are today. Eliminating unhealthy smog and carbon emissions from diesel buses is consistent with St. Petersburg's commitment to completely end all use of fossil fuels in the community. PSTA will be a great partner with Duke Energy and the City to make this switch away from oil consumption, just as the entire city moves from coal and natural gas to solar and energy efficient buildings. Today PSTA shows the way for St. Pete and Pinellas County truly being ready for 100% clean energy for all." PSTA is Florida’s second transit agency to go electric joining Tallahassee’s StarMetro, which has been running five Proterra electric buses for the past five years for FSU and FAMU students. PSTA chose to go with the world’s leading manufacturer of electric vehicles, BYD: “The Official Sponsor of Mother Nature”. BYD will install its inductive charging system along a newly revised Downtown Looper route that will include Beach Drive. PSTA could begin electric bus service as early as January, 2018. FOX13 interviews happy bus driver on electric bus Local coverage of PSTA electric bus purchase. Even more local coverage. Thanks to Healthy Air Campaign team leader Tom Krumreich for use of his photos. WASHINGTON D.C.-- Today, the U.S. Senate voted to approve Donald Trump’s nomination of Scott Pruitt as head of the U.S. Environmental Protection Agency. “The appointment of Scott Pruitt is a complete environmental and public health disaster. Based on his record of putting polluter profits before people, Pruitt will undoubtedly be the most dangerous EPA Administrator in history. “When it came to protecting his own constituents from the growing threats of earthquakes caused by fracking and coal ash pollution, Pruitt turned his back on Oklahoma families by doing nothing. He is a relentless opponent of the most necessary health protections, such as those that safeguard our families from harmful smog or air pollution in national parks, and even went so far as to question whether mercury pollution, a known toxin, is dangerous to public health. “We applaud Senator Nelson for putting Florida’s interests, like clean air and clean water, first. He has shown extraordinary leadership and judgement in voting against Pruitt’s nomination. Does this look like Everglades Restoration to you? Donald Trump's U.S. Army Corps of Engineers and Rick Scott's appointed South Florida Water Management District are moving fast on radical underwater pumping schemes to benefit Big Sugar at the expense of the Everglades. You can stop them. Email Federal Officials now to: OkeechobeeWatershedRestoration@usace.army.mil to oppose the use of Deep Injection and Aquifer Storage and Recovery (ASR) wells in Everglades Restoration. -- Using fossil-fuels to pump billions of gallons of tainted water into our aquifer is inconsistent with the goals of Everglades Restoration. 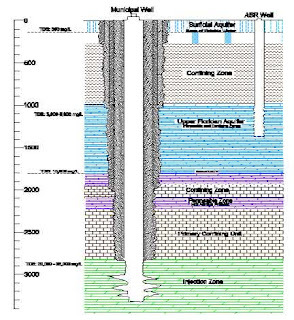 --- Deep injection and ASR well schemes threaten underground drinking aquifers with pollution. -- Deep injection and ASR well schemes waste billions of gallons of water needed for Everglades Restoration. -- Deep injection and ASR well schemes divert millions of dollars needed to buy land and build reservoirs on sugar land south of Lake Okeechobee so water can be stored, cleaned and sent south to the Everglades. Yesterday you [SFWMD] sent a news release urging South Florida families and businesses to save water, to cut down on irrigation, to get through the dry season. You said “water conservation is important all year but especially now to help sustain the regional water supply”. You told us of the historic dry month we had this past November, driest since 1932. You stated that District water managers are “operating the system to save as much water as possible”. Well, we are glad the District feels that conserving water is important. Sierra Club certainly agrees. Therefore, we cannot understand why a few days earlier you sent a news release about a so-called “historic plan” that includes throwing away billions of gallons of freshwater away permanently. That is NOT water conservation and that is certainly NOT leading by example. Sierra would like to restate its opposition to using high-cost, energy-intensive ASR wells as part of Everglades Restoration, as these do not help restore the natural flow of clean water over the Everglades ecosystem. And, every dollar spent on ASRs takes away a dollar away from restoration of the Everglades. 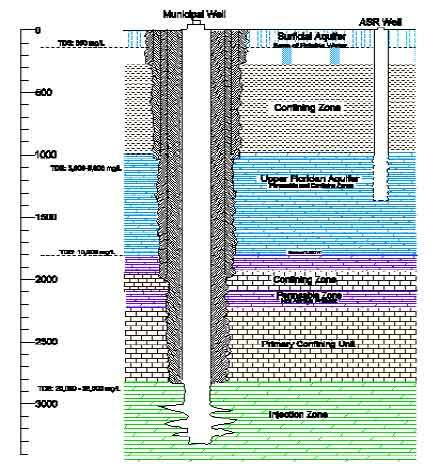 But today, let us delve into the notion of using deep injection wells as part of what should be a restoration effort. - Not enough going south were it used to flow to replenish aquifers, the Everglades and Florida Bay. Algae blooms and seagrass die-offs make easy headlines, but that is not the only water crisis we have. Besides a starving Everglades National Park and Florida Bay, we simply do not have enough water flowing south to replenish the underground source of water for millions of Floridians and tourists and to help them fight saltwater intrusion that pollutes and shuts down water wells. This contributes to higher costs for public water utilities forced to look for alternative water supplies and treat salt-polluted wells to meet their water demands. These costs are passed down to all of us. Therefore, we find it appalling that while urging us to conserve water, you seem willing to throw valuable freshwater away permanently from the water budget. Do NOT waste OUR water and stop blocking or delaying a key CERP project that calls for additional storage and treatment in the EAA to convey more clean freshwater to the south. UPDATE: Today, February 7, 2017, the Trump Administration's Army Corps of Engineers cancelled the Environmental Impact Statement (EIS) started under the Obama Administration and announced it would grant an easement to complete the Dakota Access Pipeline. Sierra Club is calling for people to send a message to the Army Corps demanding that the EIS be completed. To send a message, click HERE. Also continue to submit comments on the EIS scope to Mr. Gib Owen at gib.a.owen.civ@mail.mil. The golden hills of the Plains are incredibly beautiful and remote. It’s a majestic beauty that is intensified by vast blue sky, sun, and for me the chilly winds that November blew across the high plains. 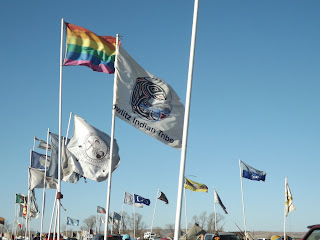 It's with this welcome that I entered the Oceti Sakowin Camp at Standing Rock. 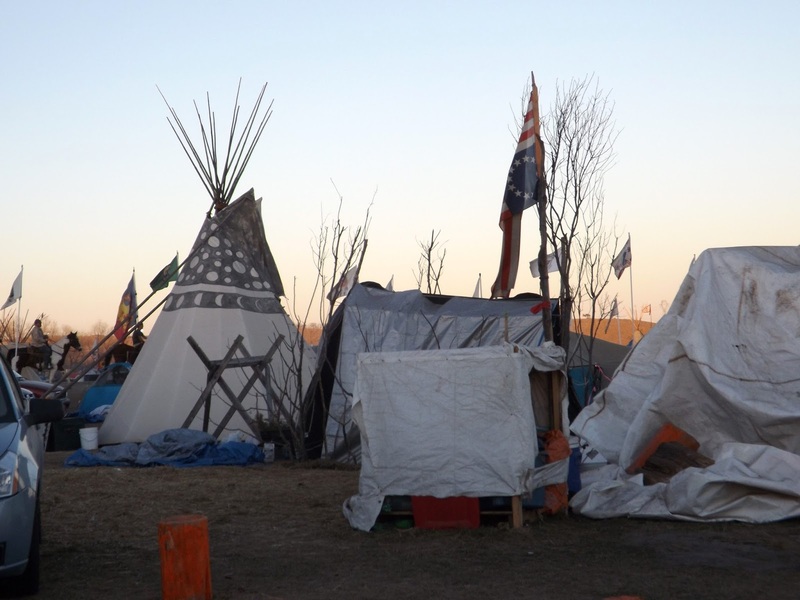 Oceti Sakowin began as an overflow camp for other nearby camps that formed early last spring. Named for the seven bands that historically made up the Great Sioux Nation, it served as the heart of the resistance for the Standing Rock Sioux Tribe which has been protecting the waters of the Missouri River as well as their sacred burial sites from the Dakota Access Pipeline (DAPL). I arrived at the encampment just as the sun had set. Once out of the car, there was a sense of celebration and prayer in the air and I found myself surrounded by the aroma of burning cedar and sage as it mixed with the scent of glowing campfires. All of this was enhanced by the sound of native drums, song and ceremony. 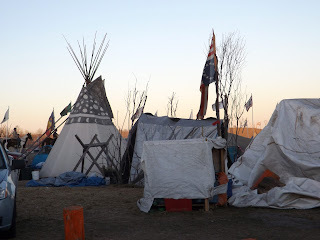 The landscape was covered with tipi's, tents of all sizes, makeshift shelters, cars, and small RV's that serve as housing for the camp of water protectors. 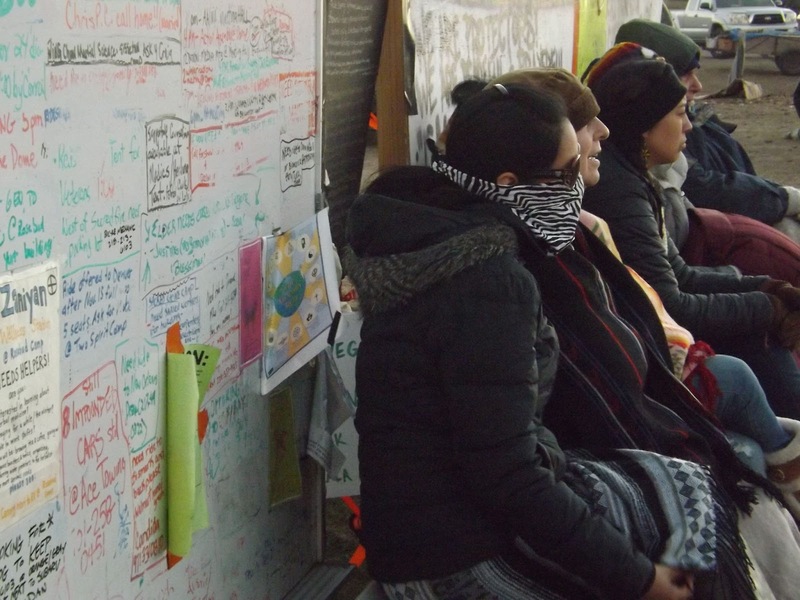 While I was there, the camp housed between 1500 and 3000 people and numbers tended to grow on the weekends. For Thanksgiving numbers increased to over 8000. 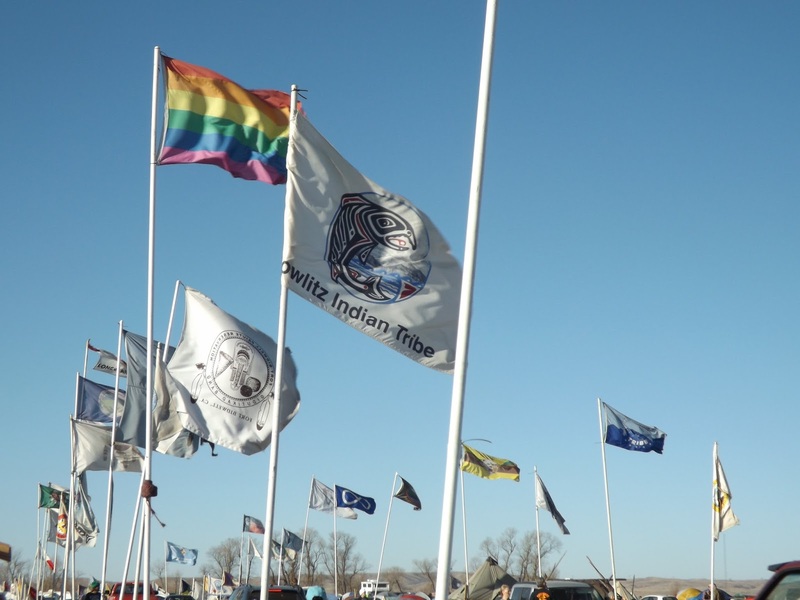 People caring about people is what makes Standing Rock a different kind of movement. Life at the Oceti Sakowin camp revolved around native spirituality, ceremony, and the sacred fire. No images were to be taken of the sacred fire, partly, as one of the elders explained, so that we have to remember what happens around the fire in our hearts. 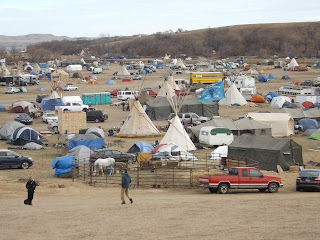 The area around the central sacred fire is lined with canopies and folding camp chairs which are reserved for elders. Speakers address fellow native water protectors and their allies as “relatives”. The amplified voices from the speakers tent serve as the communication backbone in a place where cellular service is rare. The day begins early before daybreak with the sound of the speaker urging all relatives to "get up, get up- this is why you're here, and this is what you came here for". We are encouraged to make it to the sunrise morning prayers around the sacred fire where elders sing songs of praise and encourage everyone to greet the day as human beings, with love and a determination to get it right. Throughout the day new arrivals would stream into camp. Hundreds of individuals from the world over came to offer resources and help. The volunteer tent sent workers out to volunteer their help in all corners of the camp. Winterizing the camp and preparing spaces for winter were big on the list of needed activities while I was in camp. 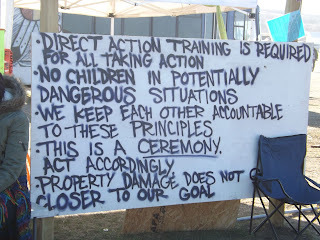 I chopped and stacked wood, helped in the kitchen, picked up trash, was trained in non-violent resistance, and participated in direct actions. At 9:00 every morning there was an orientation for those just arriving. The rules of camp were to remain in prayer and ceremony. No drugs, alcohol, or weapons were allowed, nor were the use of swear words. There is a policy of no use of cameras unless you are with the media, this is because if law enforcement were to confiscate your phone or camera others could be targeted and put at risk because of your pictures. Our government has broken every treaty that's ever been made with the Lakota, Dakota, and Nakota people. The government has ignored tribal sovereignty, Indian law, and treaty rights. In 1958, the Army Corps constructed the Oahe Dam which destroyed more native land than any other public works project in the U.S. It took 21,026 acres of Sioux land. The project destroyed 90 percent of the timber land on the reservation as well as the most valuable rangeland, most of the cultivated areas, and the tribe's wild fruit and wildlife resources. With the damming of the Missouri River, life at Standing Rock’s changed forever. It forced many native people to relocate, traditional spirituality waned, and poverty ravaged families. 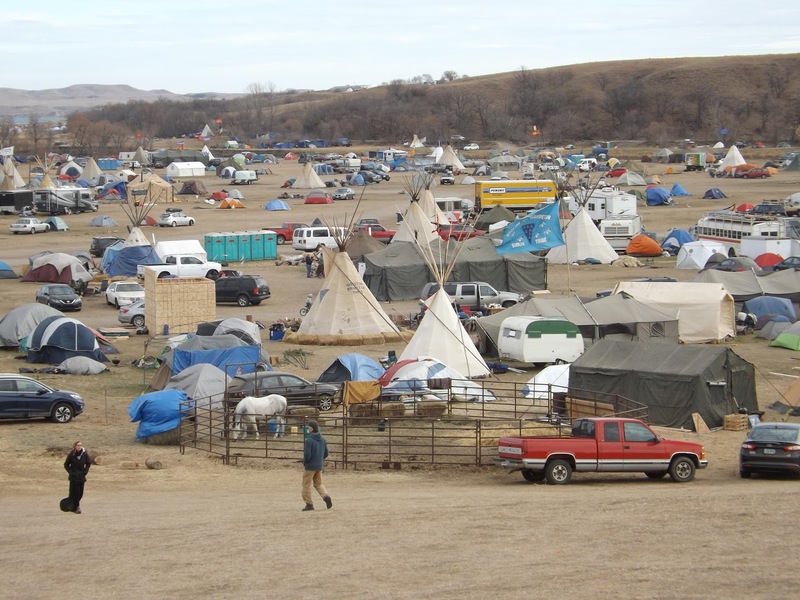 Luckily the struggle at Standing Rock has created a resurgence of the old ways in camp where the native language is spoken, the native horse culture is celebrated as youths ride on horseback, and people share their songs and dances, their prophecies, and histories. The movement against the Dakota Access oil pipeline was begun by the youth on the Standing Rock reservation who see themselves as the 7th Generation- the generation that their elders have told stories about as a fulfillment of the prophesies of Black Elk. In a vision about 150 years ago Black Elk, a Lakota Holy Man, saw different races represented by hoops and in Seven Generations he saw all hoops becoming one. The spiritual leaders and elders have prayed for the fulfillment of this prophesy and for the hoops of the nations to reunite. Black Elk's vision basically showed all the native peoples and tribes uniting along with people of all colors coming together in a sacred place to save the world. I don't know if its because of this or not, but thousands of of Native Americans from more than 300 tribes spanning the continent have now joined with Standing Rock to stand against the pipeline. This has never ever happened before. 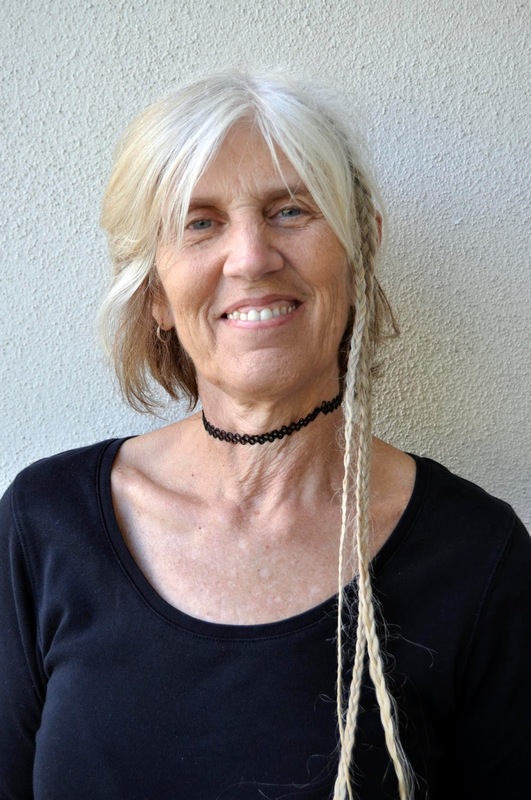 Native nations have set aside their long held differences and resentments in order to defeat the controversialDAPL pipeline which will destroy ancestral burial grounds and could poison the water supply — not only for this sovereign nation, but also for 19 million Americans who live downstream and rely on the Missouri River for drinking water. It was the Standing Rock native youth who first initiated major resistance to the pipeline. 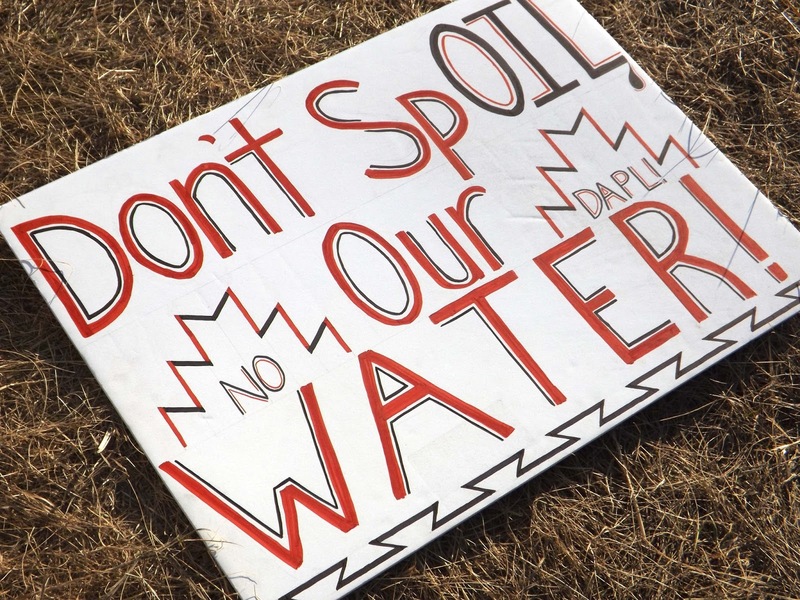 In order to hand over a petition calling for a full environmental impact study on the pipeline, they decided to run 500 miles from Cannonball, North Dakota to the district office of the United States Army Corps of Engineers in Omaha, Nebraska. Once the pipeline had been approved and construction was beginning, the Oceti Sakowin youth again began to run- but it this time it was the 2,000 miles from North Dakota to the doorstep of the Army Corps in Washington, D.C.- to meet with high-level government officials in hopes to halt the construction of the pipeline. The youth, with the support of elders, co-ordinated many of the direct actions and resistance in camp. Their creativity in the strategies they devised was nothing short of brilliant. 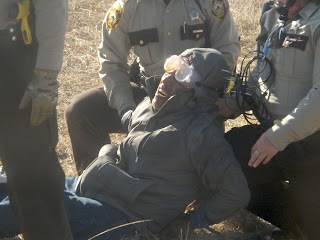 Actions like trying to stop pipeline work by walking the easement and obstructing machines, creating ceremony alongside a railroad track which slowed down the train delivering materials for the drilling platform, to gathering in prayer and ceremony outside of the Bismarck Wells Fargo which is one of the money lenders, to going to the DAPL headquarters to pray and do ceremony, or organizing 600 people to form a human medicine wheel on the banks of the river for aerial photography. These were the actions taking place when I was in camp, but everyday these talented young people create new and different actions. A barbed wire fence in front of the camp proclaimed to drivers along state Highway 1806: “We are unarmed.” Even so, a non-law enforcement helicopter, rumored to be private security, frequently buzzed overhead. At night airplanes without lights circled above the camp. At the direct actions, the police were dressed in riot gear; they sported automatic rifles, mace, canisters of pepper spray, rifles with rubber bullets and had armored vehicles. Over militarization of the situation would be an understatement for a setting with unarmed civilians standing in prayer. It looked and felt more like Gaza than the United States. 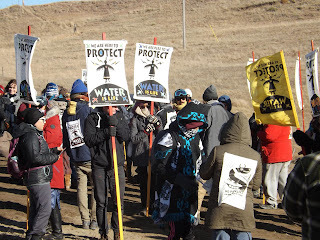 While on the front lines I saw a span of generations- teenagers, young adults, adults, and elders who bring their appreciation and respect for Wni Wiconi- Water Is Life to the direct actions. They understand with all their hearts that there would be no life without water. Water plays an essential part in their ceremonies. One thing is for sure, you can't drink oil. The water supply on the reservation is dependent on the Missouri River because the water table is too deep for it to be practical to drill wells. I was told by a generous reservation family that allowed me and others to bathe at their home that because the pipeline is just a half mile from the northern border of the reservation that their water supply would be contaminated within 45 minutes if there was ever an oil spill. 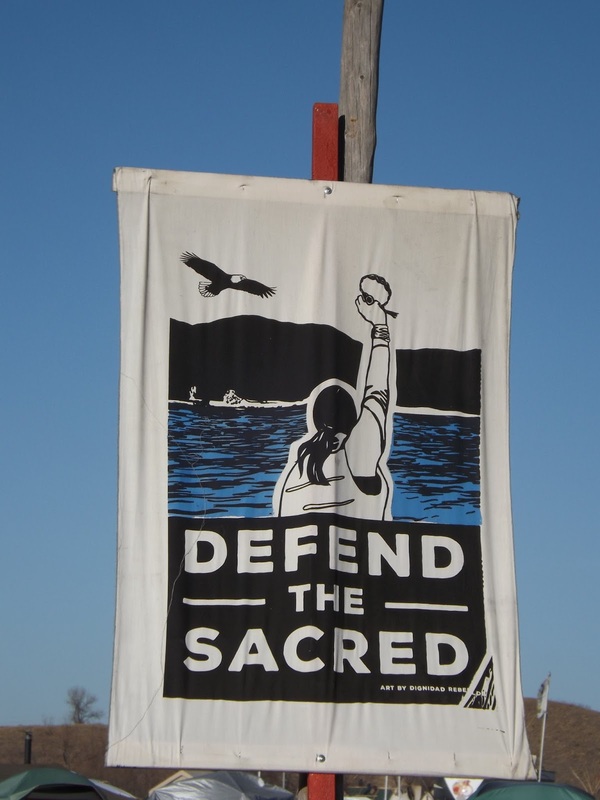 On Dec. 4th there was an announcement of a temporary halt on the pipeline called by the Army Corps of Engineers to potentially resolve the Tribe’s concerns that the earlier permitting decision had not fully considered their interests and route alternatives. This was just after 4,000 veterans had arrived in Standing Rock. There were celebrations in the Water Protectors' camps, yet it seemed to people on the ground to be an orchestrated de-escalation. Those 4,000 vets added to an existing 10,000 people already in camp and this attracted big media coverage. 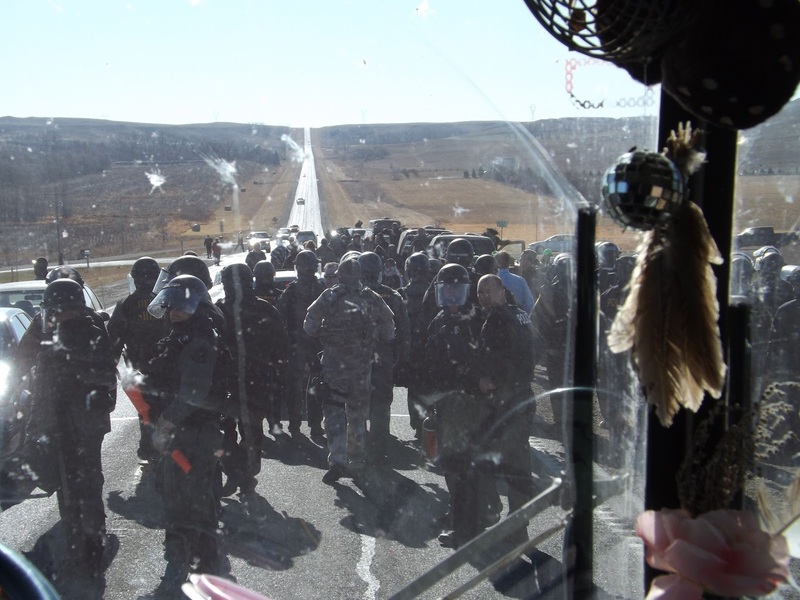 The eyes of the world were focused on Standing Rock where riot ready law enforcement were facing the unarmed military personnel that had come with the mission to protect the right of the Water Protectors to peaceful protest. At the time it seemed that the powers that be could not afford the visual of armed military riot police and DAP'L mercenaries going up against unarmed military and civilians standing in prayer in a setting that often looked and felt more like Gaza than the United States. On January 18th, the Department of the Army published the Notice of Intent to require an Environmental Impact Statement (EIS). 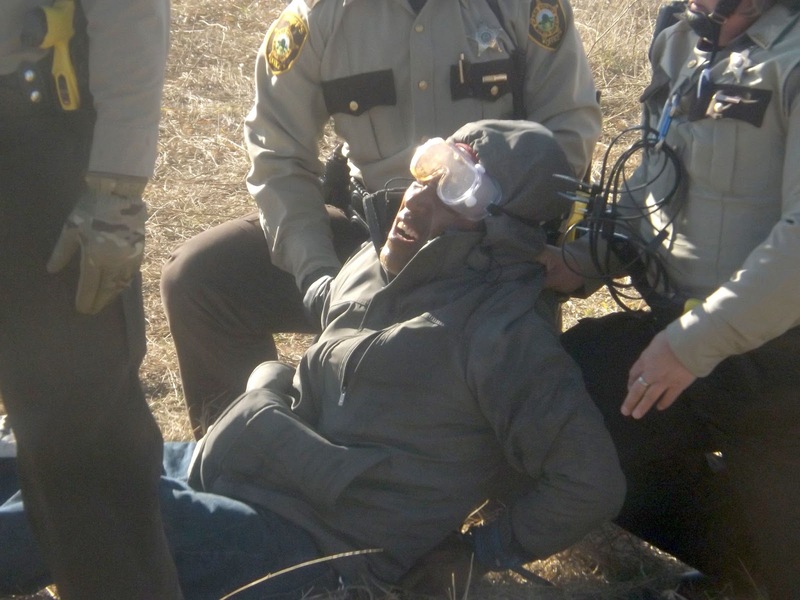 The EIS was exactly what Water Protectors and tribal leaders were calling for. They wanted to make sure it fully took into consideration tribal treaty rights, natural resources, cultural and sacred places, socio-economical concerns, environmental justice, and the health and wellbeing of those downstream who rely on the Missouri River for drinking water. The Department of the Army's Civil Works division announced it would accepted public comment until February 20th, 2017. 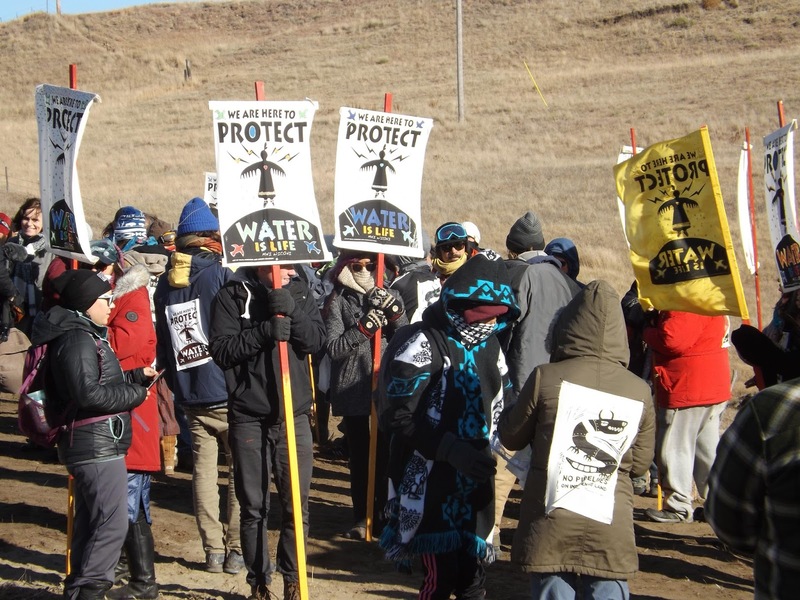 The tribal leaders asked all interested citizens to please help the Water Protector movement by sending comments to ACOE to identify potential issues, concerns, and reasonable alternatives that should be considered in this EIS. Meanwhile commritten comments on the EIS scope may be submitted via email to Mr. Gib Owen at gib.a.owen.civ@mail.mil. Use “NOI Comments, Dakota Access Pipeline Crossing” as the subject of the email. Postal service or hand delivery by advance arrangement may be addressed to Mr. Gib Owen, Office of the Assistant Secretary of the Army for Civil Works, 108 Army Pentagon, Washington, DC 20310-0108. 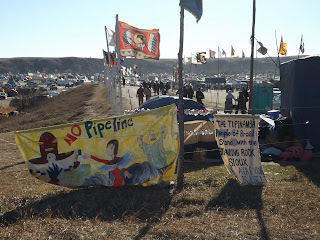 Include submitter’s name, return address, and “NOI Comments, Dakota Access Pipeline Crossing” on the first page. Months ago there was a rumor that there had been a two and a half million dollar donation given for legal fees- turns out that is not true. Funds are still needed to coordinate the criminal and civil litigation efforts of the water protectors. If you feel drawn to helping the legal team who is supporting arrestees, you can mail a check payable to "Water Protector Legal Collective" to PO Box 69, 300 Collins Ave., Mandan, ND 58554-9998.